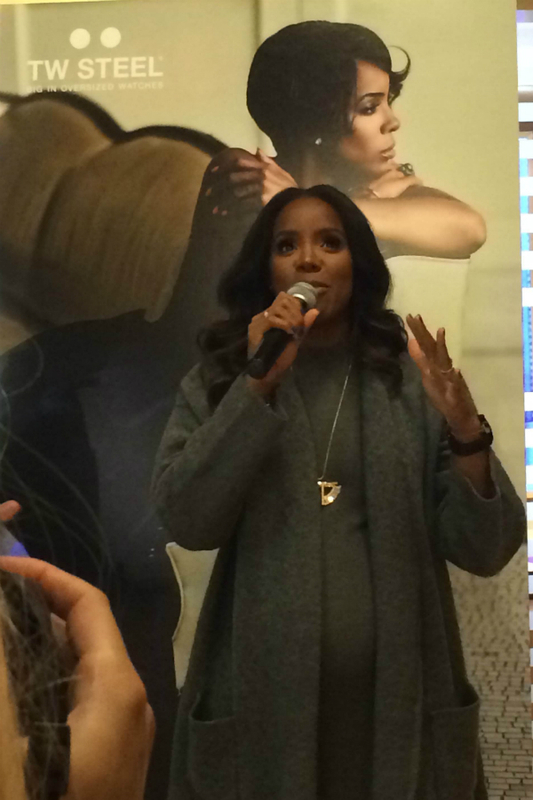 If I look as great as Kelly Rowland when I’m on the verge of having my first child I’ll be a very lucky lady! 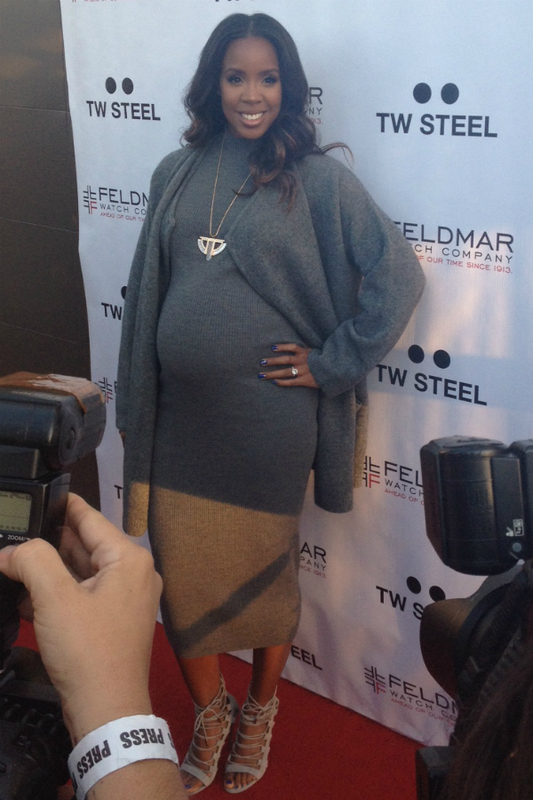 I met the former Destiny’s Child singer at the launch of her new Canteen watch with Feldmar Watch Company’s T.W. Steel in Los Angeles recently as I enjoyed a night out with my friends Bonnie, Orion and Amir. 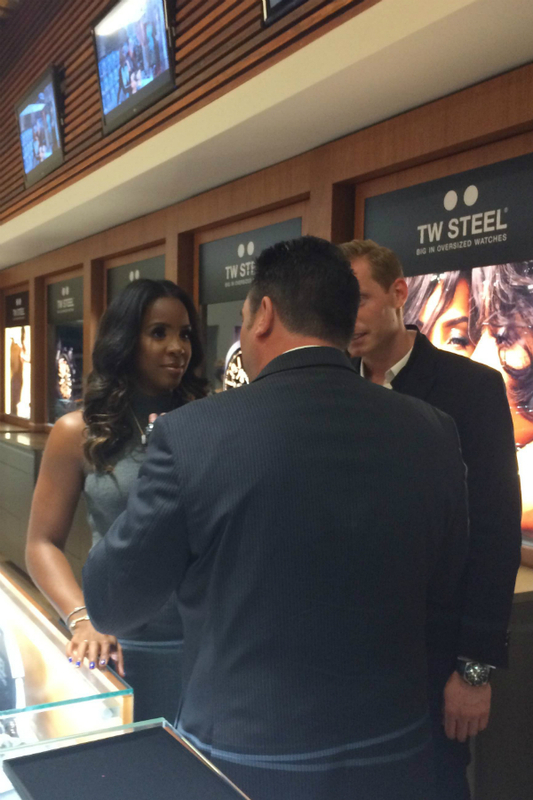 Before the guest of honour arrived it was great to see just how many stars had their own timepieces for T.W.Steel. We spotted ones by the likes of David Beckham and Leonardo DiCaprio too as we sipped on premium tequila cocktails mixed at the in-store bar. When Kelly finally did arrive an hour into the bash, I was surprised at how long she spent taking photos to be honest. She dressed in a form-fitting grey sweater dress and understandably, as she was pregnant, a lot of people wanted to capture her large baby bump on camera. But it was her own personal Instagram shots as she came in from the red carpet to take snaps of her piece in the cabinet which required the perfect lighting. So a few members of the paparazzi had to break the rules and come inside the party to provide extra bulbs at Kelly’s request. I thought she looked glowing and great already but Kelly and her assistant clearly know how to make her look best so I won’t argue with that. Plus when you’re competing with the likes of Kim Kardashian on social networking sites, what’s a celeb to do? Kelly’s new husband, Tim Witherspoon was on hand to take care of his lady, who had to be regimentally ushered around as she was so in demand yet ready to pop. America’s Got Talent’s Season 6 contestant Fantastic Fig provided entertainment on an individual basis – minus his Cat Newton – and I was pretty pleased he spent plenty of time with us showing us lots of tricks and making us laugh. Here’s a video of him auditioning in 2011 and check out all the behind-the-scenes pics of Kelly launching her new watch.